TRON lost 10% in recent 24 hours amid general crypto sell-off. Break above $0.0600 is needed for an extended recovery. Tron, the 9th largest digital asset by market capitalization, has been falling for the second day in a row. The coin extended the sell-off after breaking 50-DMA, currently at $0.0670. 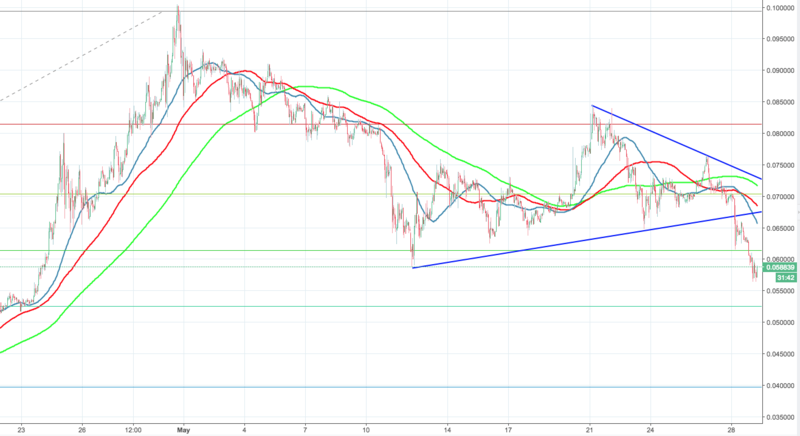 Immense selling pressure caused by massive downside correction on cryptocurrency markets pushed the price towards $0.0564 during early Asian hours. Currently, TRX/USD is changing hands at $0.0576. Tron's market value decreased to $3.8B from $.3B a day ago, while trading volumes jumped to $464M. Tron has lost over 10% in recent 24 hours. Neither the news that Tron's founder Justin Sun purchased BitTorrent, nor the announcement that Taihao Fu, another tech guy from IBM joined Tron's team managed to mitigate the decline. Note, that TRON is about to launch its MainNet, which may reverse the trend for the coin.